There are only a few of these handmade books left. Steven is no longer making them. An earlier version of Songs Of Sobriety. C. Steven Blue: written, designed, printed and hand crafted; using all natural materials. Each book was hand signed, dated and numbered on the day it was made. S.O.S. is an inspirational journey of one man's struggle for recovery from alcoholism and drug addiction. It is a journey of the first ten years of recovery; told through the poems written during those years: struggling first to get clean and sober, then to stay in sobriety and live a happy and fulfilling life. Readers of this book have said they believe this book is for anyone, not just those in recovery. We all have our own struggles in life and this book can be inspirational and enlightening to anyone. 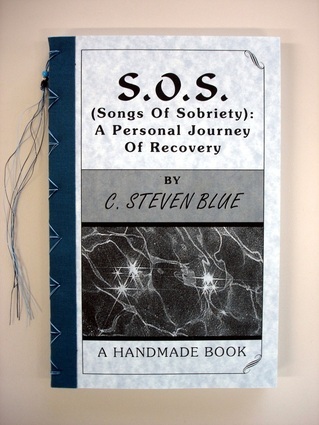 It is Steven's hope that this book may help and inspire those who are struggling to get into recovery from addiction of any kind, those who are already in recovery, those who may have a family member or loved one struggling and even those who have a friend or co-worker who is in a struggle to recover. It is a struggle of the brave, to be sure!